CD by The Mountain Goats. Singer/songwriter John Darnielle, when touring alone with his acoustic guitar, would often introduce himself with, "Hi, we're the Mountain Goats." Darnielle is The Mountain Goats, just as much as Mark E. Smith is The Fall. A prolific songwriter, Darnielle has released his 15th recording: Heretic Pride. He has been recording material (via cassette only) since 1991, and the releases of B-sides and rarities have been overwhelming. And, as Mark E. Smith uses Can (or other Krautrock repetitions) as one of the Fall's musical boilerplates, Darnielle uses Lou Reed's Transformer-era, in particular, as his. In a 2004 interview with The Believer, Darnielle spoke of his growing fondness of Lou Reed's Transformer while in high school, setting him apart from his friends who were into prog rock. "My prog friends thought Lou Reed was a joke. They would say, 'Do you like this because it's funny that he can't sing?' and I'd say, 'No, that's not it,' and they'd say, 'Well it has to be, there no good guitar,' and I said, 'It's different from that.' They'd always argue that the only way you could like Lou Reed is if you were in some way laughing at the fact that he couldn't sing or that the songs were so simple." Darnielle has honed that same sort of simplicity with eloquent orchestration and subtlety. There's no confusing his spiky vocals, just as no one would confuse Lou Reed's deadpan delivery. But Darnielle has a better sense of melody (in other words, he does a bit more singing, rather than talking). 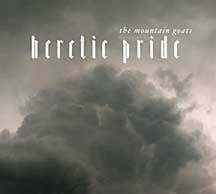 For Heretic Pride, The Mountain Goats (the core band consists of: Peter Hughes, bass; Jon Wurster, drums; Franklin Bruno, piano and organ; and, Erik Friedlander, cello), in collaboration with longtime producer John Vanderslice and Scott Solter, create a sharp-sounding recording that matches the delicateness of 2006's Get Lonely or 2007's The Sunset Tree. However, the production of the songs on Heretic Pride is so clear that it brings out a certain jaggedness and edge that seemed lacking in the earlier releases. Darnielle's songs are inhabited by the usual cast of lost, down-and-out, inept, bipolar, tweaked-out, abusive characters. Instead of judging them, he inhabits them in personification songs. The title track, "Heretic Pride," for example, starts with a startling, uplifting vocal burst, "Well they come and pull me from my house/ And they drag my body through the streets/ and the sun's so hot I think I'll catch fire and burn up/ In the summer air so moist and sweet/ And the people all come out and cheer/ Rocks in the pathway break my skin/ And there's honeysuckle on the faint breeze today/ With every breath I'm drawing in..." It sets up a horrific, violent scene, with the narrator finding some bizarre joy being in the middle of this mayhem. And, in a sense, we, society, are "the people" in this dark story. The spare beauty of cellist extraordinaire Erik Friedlander perfectly frames Darnielle's nervous vocals in "San Bernardino," transforming this Southern California suburb into Southern Gothic. (Friedlander's latest releases can be found on the Cryptogramophone label.) And on "Lovecraft in Brooklyn," The Mountain Goats actually rock, propelled along by drummer Jon Wurster's snapping snare. Though Heretic Pride doesn't surpass the brilliance of 2004's We Shall All Be Healed, Darnielle continues to carve out his unique, simplistic and engaging form of songwriting/storytelling, by simply keeping faithful to the new album's heretic title: Darnielle is a true nonconformist, and like his characters he finds unusual joy in dissenting from the established order.